Looking for a team-building activity that everyone will rave about? 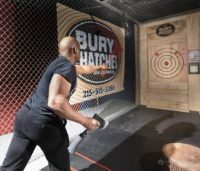 Plan your next corporate event at Bury The Hatchet and you’re sure to impress everyone in the office. Our team building events are high energy, fun, and SAFE. Not to mention we offer a truly one of a kind experience – unlike some of the boring offsites you’ve attended in the past (can we say trust fall?). We can easily accommodate groups of all sizes – from 12 to 90+ people at a time. Plus, we’ll help you coordinate catering from nearby local restaurants and even award a special trophy to the axe throwing tournament champion! At your axe throwing event you’ll get a private lane, or lanes if you have 12+ people, where you’ll learn how to throw and practice. Each event starts with individual coaching and instruction from a dedicated Axe Master(s), who will stay with you and oversee your game as well. Our Axe Masters are experts and trained professionals who will have your group hitting bullseyes before you know it! Then, a round robin style tournament begins. Each participant will play every other participant once to rack up points and rank you for the championship tournament. In the end, only 1 player will be left standing and he or she will be crowned the axe throwing champion! 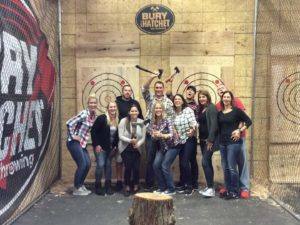 Why Choose Axe Throwing For Your Next Team Building Event? Typical, ordinary, status quo, average…these aren’t qualities you want in your employees, so why should they be qualities of your team building events? At Bury The Hatchet we’re taking team building to the next level and putting a little spin on corporate events. Get your team or clients out of the mundane office setting and into an environment where they can relax and have some fun…together! Our events will help build connections between team members, and strengthen existing ones without being awkward or forced, like other team building activities. Groups will naturally interact and work together over a friendly game of axe throwing. They’ll root for and encourage one another and even relieve any underlying stress from the workplace. Overall your team will get to enjoy a once in a lifetime experience together, and leave a more bonded and cohesive unit than when they arrived! 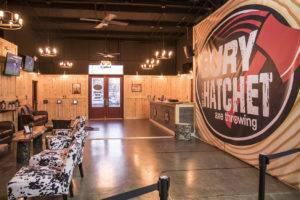 Bury The Hatchet is ideal for throwing private group events. Perfect for birthday parties, family or school reunions, bachelor/bachelorette parties, smaller team-building events, charity fundraisers, or just a fun girls or guys night out. All events kick off with safety guidelines and throwing instruction from one of our Axe Masters before tournament play begins. Each private or group event is overseen by a dedicated Axe Master, who is a trained hatchet throwing professional. They provide one on one instruction so everyone can learn how to throw an axe, before watching you practice and prepare for your tournament. They stay with you the entire game to ensure your safety and manage your group’s tournament. Private events are designed for groups of 12 to 30 people and last ~2 hours. For pricing and more information on private events please visit our Locations page for individual store contact info and call or email us today! 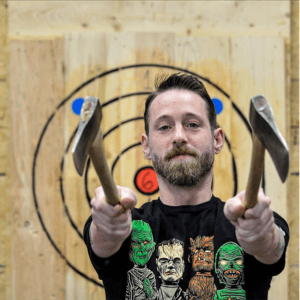 No Skill Level Required: Most people have never thrown an axe before so don’t worry if you haven’t – we’re well versed in teaching first timers since the majority of our customers are. More importantly though, ANYONE can do axe throwing! Whether you’re athletic or not, young or old, tall or short, it doesn’t matter. This activity is accessible and fun for everyone. Safety First: Our #1 priority is safety, yours as well as ours! We take safety measures very seriously and have implemented the necessary rules and precautions that have kept us incident free since opening our first location. Bring Food and Drink For FREE: Want your event catered? No problem. We’re here to assist with food so it’s filling and fun for everyone. We can give you a list of nearby restaurants to choose from and assist with coordinating delivery. We have plenty of picnic style tables between lanes for dining and fridges for keeping food fresh. We’ll even set up party decorations for you if requested! Rain or Shine: Many other team building activities take place outdoors and rely heavily on nice weather to go well. Not axe throwing. 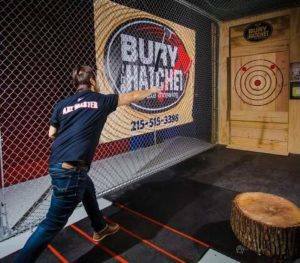 Since axe throwing is an indoor activity you can enjoy events at Bury The Hatchet all year long. Casual and Comfortable Attire: The office is the place for tight ties and high heels, but at Bury The Hatchet everyone can relax and enjoy wearing casual attire (like jeans and a plaid shirt). Every day is casual Friday here and your team will love the chance to dress down for an event. Just another way axe throwing lets people let loose and enjoy themselves.